The Pacific razor clam is found along the Pacific Coast from Alaska to California. Razor clams are found along ocean beaches and sheltered coves along the coast. Razor clams in the southern part of their range usually grow to a length of six inches. In Alaska, razor clams grow to approximately eleven inches in length. 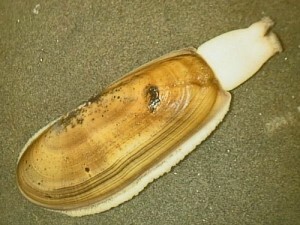 Pacific razor clams are used in chowders and other dishes.